SPACES is a collaborative project developed in 2010 by Arts Huntsville, Alabama A&M University, Huntsville Museum of Art, Lowe Mill ARTS & Entertainment Center and UAH. Originally designed as a biennial sculpture installation, the founding institutions welcomed the Madison Arts Council to the SPACES Sculpture Trail project in 2012 and Ditto Landing in 2017. Now featuring 39 total sculptures, SPACES is designed to engage and enliven the Huntsville/Madison County community through a large-scale public art installation. SPACES Sculpture Trail features the work of 22 artists from 12 states across the United States including Alabama, Arizona, Colorado, Florida, Georgia, Indiana, Michigan, Mississippi, Missouri, New York, North Carolina, Virginia as well as Toronto, Canada. From January 2017 – January 2019, we invite you to visit the SPACES sculptures throughout Huntsville and Madison. 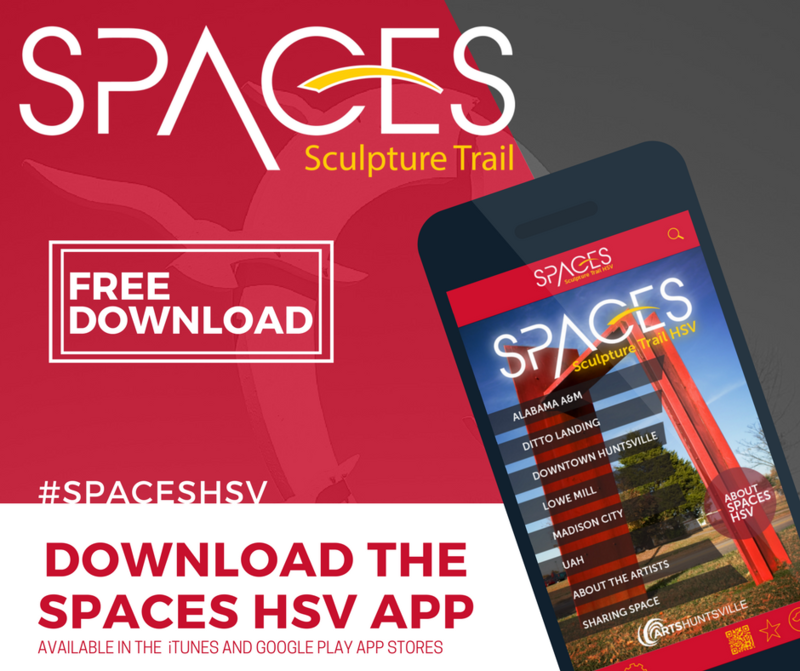 Explore the trail using the SPACES HSV app, available for free in the iTunes and Google Play stores.